I just finished reading the book Unbroken. Have you read it? It's a painful read. It's an inspiring read. I was recounting the story to the husband (who is not a reader), and he said, "How can you read about such awful things?" Unbroken tells the story of Louie Zamperini, an Olympic runner who survived 47 days on a life raft after his plane went down during World War II. He then suffered through two terrible years as a prisoner of war in Japan. What he went through is literally unthinkable. I cannot imagine how anyone survived and persevered through the hardships he had seen by age 30. While it is very hard to read about the endless torture he endured as a POW, it is so important to fully understand the sacrifice of the soldiers who have fought for our freedom over the years. As America celebrates her independence today, what better time to celebrate a true American hero? When I finished the book yesterday, I googled Louie Zamperini to see how old he is now. I was shocked and saddened to see that he just passed away – only two days ago – at the age of 97. Many POWs who survived the war went on to live shortened lives because their bodies had been through so much, so it is truly remarkable to think that he lived to the ripe old age of 97. Remarkable, just like his entire life. Unbroken will hit theaters later this year, but I have no idea how they will fit Louie's life into a 2.5 hour movie. I'm so glad I read the book first so I can understand the full scope of his life, which surely cannot be compacted into a movie without removing some of the important details. 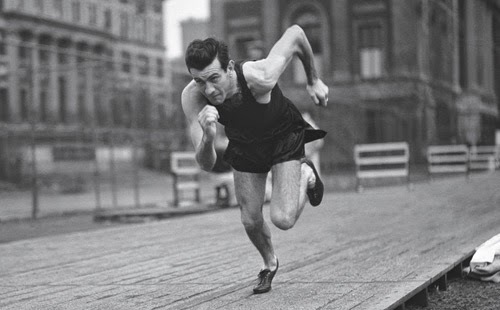 GO LOUIE ZAMPERINI! GO AMERICA! Have a safe and happy 4th of July! God Bless America.